The BeoLab 9 was to be an important product for B&O. 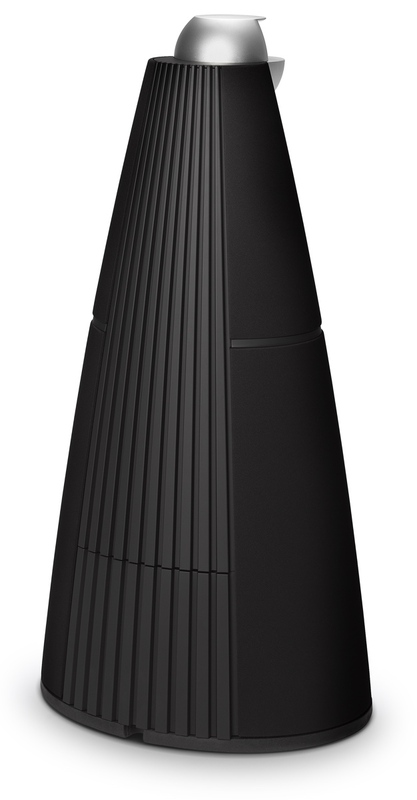 Placed near the top of the loudspeaker range, It was intended to replace the Beolab 8000 as the most visually distinctive model in the B&O loudspeaker line. Even though the Beolab 8000 was only an average performer it was visually both distinctive and attractive. Such was the success of the styling of the Beolab 8000 that it had remained in the range unaltered in appearance since 1992, a tough act to follow. Text copyright © Beocentral. Unauthorised reproduction prohibited. Technically, the BeoLab 9 replaced the BeoLab 1. It used similar internal arrangements, though in detail it was all new. When compared to the Beolab 8000 the accent was clearly on performance, with larger drive units and much more powerful amplification. The move away from a column to a cone shape also allowed larger drive units than the BeoLab 1 could accommodate, which was also encouraging from a sound quality point of view. The new shape also gave a visual link to the BeoLab 5, though the two models had little of substance in common. Text copyright © Beocentral. Unauthorised reproduction prohibited. The most distinctive feature of the BeoLab 9’s design was the “acoustic lens” that surrounded the upward facing tweeter. The action of the acoustic lens is explained in the description of the BeoLab 5 and the same principles, though on a smaller scale, were applied to the design of the BeoLab 9. Text copyright © Beocentral. Unauthorised reproduction prohibited. The BeoLab 9 used 3 drive units, described as a 10” woofer, a 5” midrange and a 0.75” dome tweeter. This made for a nominally 3-way loudspeaker, though given the sizes of the drive units and their crossover points the effect was more akin to a small 2-way loudspeaker working in conjunction with a well-matched subwoofer. This setup can be contrasted with the earlier Uniphase models (e.g. the Beovox S 80.2) to see how the design parameters had changed. Text copyright © Beocentral. Unauthorised reproduction prohibited. As 3-way active design the BeoLab 9 required three separate power amplifiers. B&O demonstrated their ability to for a rational solution from the available technologies by selecting a class-D amplifier (ICE Power to give it its marketing name) for the woofer and two conventional linear class AB amplifiers for the midrange and treble. This was an inspired choice, the bass amplifier could be made very powerful (500W) without having to make the cabinet too big or the heat sinks too obtrusive and the heavy, and the well damped bass driver was largely insensitive to the types of distortion it generated. Meanwhile, the sensitive midrange and tweeter loudspeakers, which at 100W each needed much less power, were fed with a pure signal which only a proper linear amplifier can provide. A hybrid based design was chosen using a single package whose two channels would normally have been used for left and right in a conventional amplifier. This arrangement was common to many loudspeakers in the BeoLab range. Text copyright © Beocentral. Unauthorised reproduction prohibited. An electronic switch mode power supply was used instead of a conventional mains transformer, bringing with it the advantages of high power density, low cost, light weight and the elimination of the need to adjust the line voltage for different markets. The last item was the only one of technical merit, although one can see how the other attributes would be attractive to the manufacturer. Text copyright © Beocentral. Unauthorised reproduction prohibited. B&O were clearly conscious of the poor reliability record of their earlier active loudspeaker models when designing the BeoLab 9. Elaborate protection systems were built in that protected the loudspeaker units against both overdriving and overheating. This was clearly wise given the BeoLab 9’s potential power output. Text copyright © Beocentral. Unauthorised reproduction prohibited. Connections to the audio system were made by Powerlink cables. Older or non-B&O equipment could be made using special cables terminated in a variety of standard type plugs. A switch on the loudspeakers set the input to “line” mode to allow these cables to operate correctly. The traditional “free/wall/corner” equalising switch was also present. The BeoLab 9 lacked the complex digital input, digital signal processing and automatic calibration functions of the BeoLab 5 but then it was also considerably cheaper. High quality was assured as the available resources were directed towards the essential parts of an active loudspeaker rather than clever gimmicks that were unlikely to be used much. Text copyright © Beocentral. Unauthorised reproduction prohibited. Well designed, well thought out and well made, the BeoLab 9 really did deserve success. Text copyright © Beocentral. Unauthorised reproduction prohibited.